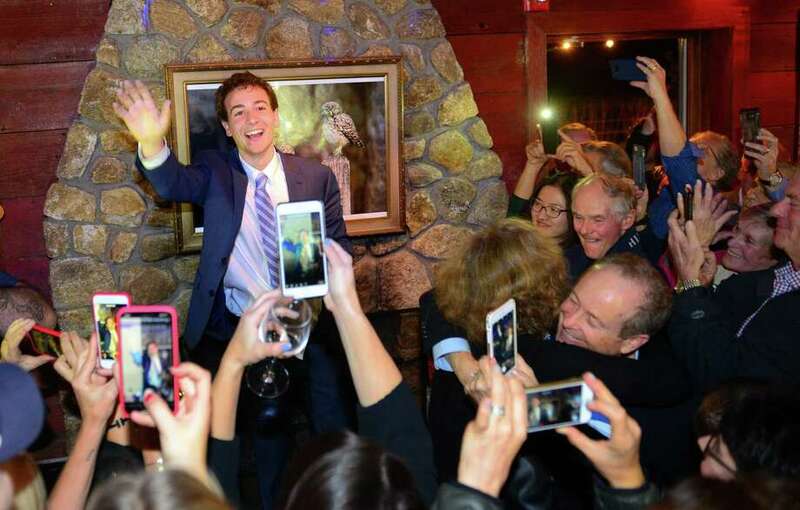 Democrat Will Haskell waves to supporters after defeating incumbent Republican Toni Boucher for state senate during a post election party at the Little Barn in Westport, Conn., on Tuesday Nov. 6, 2018. WESTPORT — How the 22-year-old Democrat Will Haskell defeated longtime incumbent Toni Boucher for the 26th state Senate seat is a question to be unpacked in the days and weeks to come, but one thing is clear now: a historic increase in the number of people who voted Democrat across district towns contributed to Haskell’s victory. In total, 5,092 more people voted for a Democrat to represent District 26 than had in 2016. Meanwhile, Boucher received 10,106 less votes than in 2016 when she won 60.19 percent of the vote in the district, which hasn’t been represented by a Democrat since 1973. Haskell earned 64.21 percent of the vote in his hometown of Westport, compared to Boucher’s 2016 opponent, Democrat and fellow Westporter Carolanne Curry, who came away with a comparatively less 48.25 percent of the vote in that town. He expectantly found his greatest gains in liberal-leaning Westport, but it came as a surprise when Haskell beat Curry’s 2016 turnout vote in every other town in the district — New Canaan, Redding, Ridgefield, Weston, Westport and Wilton — by at least 10 percentage points. That is, except in Bethel, where Haskell gained 7.5 percentage points over Curry, who earned 40.65 percent of that town’s vote. Wilton, where 68-year-old Boucher lives, gave Haskell 47.73 percent of the town’s vote, up 15.29 percent from Curry’s turnout and the second-largest percentage gain for Haskell in any district town after Westport. In total, Haskell took 53.3 percent of the district vote, compared to Boucher’s 46.69 percent. In real numbers, Haskell won 27,991 votes while Boucher received 24,521 votes, according to unofficial results provided by the secretary of the state’s office Wednesday. Compared to Boucher’s 34,627 versus Curry’s 22,898 votes in 2016, this shows a decrease in overall turnout by 5,013 voters. These numbers could suggest a trend of increased Democratic registration in district towns has, in part, contributed to the fulfillment of Democrats’ electoral victories. In New Canaan, where Lucy Dathan won the 142nd House District over two-term Republican incumbent Fred Wilms on Tuesday, Democratic registration has increased 4 percent since last year, rising from 2,869 in 2017 to 2,986 as of Oct. 1. Datham will be the first Democrat to ever hold the 142nd district seat. Meanwhile, registered Republicans in New Canaan have decreased 2 percent since last year, from 6,425 in 2017 to 6,284 as of Oct. 1. In Westport, the trend of rising Democratic voter registration goes back a decade. In 2010, the number was 6,322 compared to 7,187 this year. The number of registered Republicans in Westport likewise decreased from 4,921 in 2010 to 4,446 this year. In Westport, turnout was about halfway between most midterm and presidential years, though exact numbers are not yet available, town Registrar of Voters Marla Cowden said Thursday.